Festool is basically the Ferrari of woodworking tools. I love them and have slowly added to my collection over the years. Although I often curse the Germans at the expense I keep going back, simply because they are the best. They make the best tools possible at any cost and say F U- youre gonna have to pay if you want the best… pretty much. And I buy them! 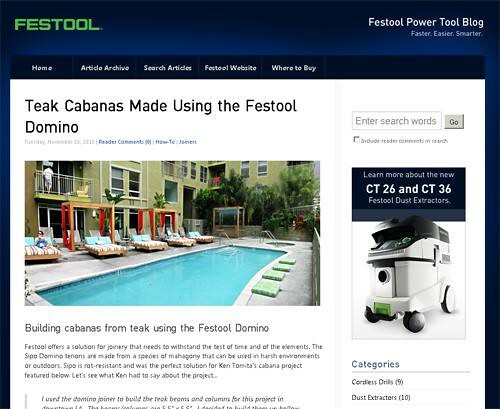 Pretty cool- they featured my Teak cabana project in their blog. Click the image to link to it! I’m more proud of this than being on TV 3 times! This entry was posted on Wednesday, November 17th, 2010 at 10:31 pm	and is filed under Uncategorized. You can follow any responses to this entry through the RSS 2.0 feed. You can leave a response, or trackback from your own site.